Solution: Consider the following reaction: 2 H2O2(aq) → 2 H2O(l) + O2(g). The graph shows the concentration of H2O2 as a function of time. Use the graph to calculate the following.The average rate of the reaction between 10 and 20 s.
Consider the following reaction: 2 H2O2(aq) → 2 H2O(l) + O2(g). 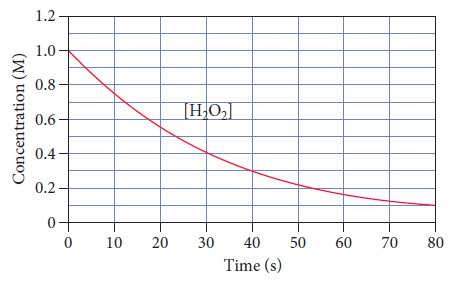 The graph shows the concentration of H2O2 as a function of time. Use the graph to calculate the following. The average rate of the reaction between 10 and 20 s.